Ingredients: Iodine 2%, Potassium Iodide 4%, Distilled Water 94%. 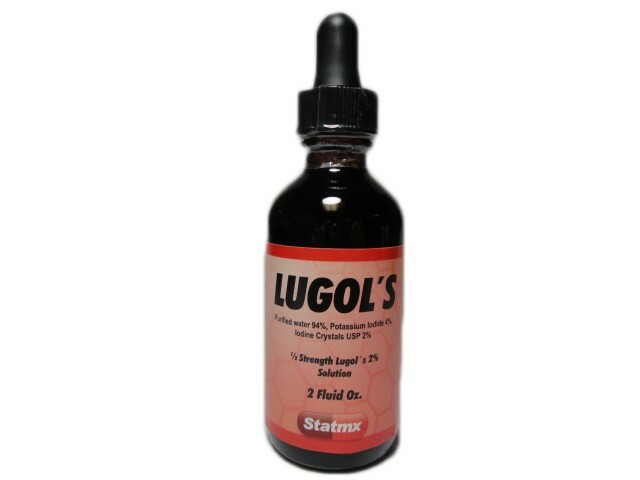 Lugol 5% : Each VERTICAL drop is about 6.25 mg's of iodine/potassium iodide (2.5 mg iodine, 3.75 mg potassium iodide) and 2 drops is about 12.50 mg's of iodine/potassium iodide (5.0 mg iodine, 7.50 mg potassium iodide). For LUGOL 2% wich is the one we sell, the amounts above are slightly less than half of those measurements.